Essar Global Fund Limited is an investment fund managed by its investment manager, Essar Capital Limited. The Fund is a global investor, controlling a number of world-class assets diversified across the core sectors of Energy, Metals & Mining, Infrastructure (comprising ports and EPC businesses) and Services (primarily comprising shipping and BPO businesses). The aggregated revenues of the Fund’s portfolio companies total US$27 billion. The Fund’s portfolio companies employ over 60,000 people across four continents. 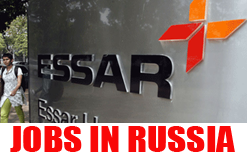 Essar began as a construction company in 1969 and diversified into manufacturing, services and retail. Over the last four decades, it has grown through strategic global acquisitions and partnerships, or through Greenfield and Brownfield development projects, capturing new markets and discovering new raw material sources. Opp. Radio Station, Beside Ramachandra Ridge, Kurmannapalem. Client Interview shortlisted candidates only.